One of Russia’s most famous military officers, as well as a notorious spy, Vitaly Shlykov died on Nov. 20. He made his mark on both Russia and the Soviet Union. On Nov. 17, I called Vitaly Shlykov for a comment on Russia's accession to the WTO. “No time for such rubbish,” he said, somewhat grumpily. “Russia does not need it, but trying to prove it now would be pointless.” Shlykov died unexpectedly on Nov. 20. Vitaly Shlykov lived in a modest, one-bedroom apartment right until his death. Over the last few years, he was often in the spotlight, and legends about him are sure to appear as time goes on – legends not only about what he considered to be the happiest period in his life, when he worked as a spy for the Main Intelligence Directorate of the General Staff of the Soviet Defense Ministry (GRU). He was a contact for Dieter and Ruth Gerhardt, Soviet spies who were engaged at Silvermine, a top secret South Africa-based center for tracking aircraft and ships. Considering the value of intelligence information, the case is regarded as one of the most successful espionage operations of the Cold War era. After he was uncovered in Switzerland, Shlykov spent two years in a local prison. Upon his return to Moscow, Colonel Shlykov, on the instructions of the GRU leadership, set up a bureau for scientific assessment of NATO’s military and economic potential. Astoundingly, the scientific assessment revealed that the General Staff was blowing NATO’s military threat dramatically out of proportion. The exaggerations were intentional, and were classified as an abuse of power: The more tanks that were produced in response to the “threat from the West,” the more stars found their way on to the generals and colonels’ epaulettes. Bound by every level of classification imaginable, and unimaginable ones too, Shlykov started looking for a chance to reach the country’s political leadership in order to bring the real state of affairs to their notice. “Luckily, it was no longer customary to throw spies in camps and destroy them, so I wound up being sent into retirement almost immediately upon reaching the pension age in early 1988,” Shlykov said. Incidentally, Shlykov refused to return to the subject in an interview ahead of the 65th anniversary of the victory over Nazi Germany: “They – the veterans – are so few now… Why spoil their day with the awful truth?” he said. In October 1990, Vitaly Shlykov became Deputy Chairman of the State Committee of the Russian Soviet Federative Socialist Republic for Public Security – the precursor of Russia's Defense Ministry. In this capacity, he worked out a concept for radical economic reform that differed fundamentally from that put forward by young reformers. When his ideas failed to be appreciated by the state leadership, he resigned from the government and devoted himself to his favorite occupation – comparative analysis of the structure and organization of armies worldwide. He discovered that, irrespective of the system of military recruitment, whether the army consisted of conscripts, volunteers or militia, all modern armies shared over a dozen features, none of which were typical of the Russian army. His layouts were largely used as the groundwork for the current army reform. In 2010, “Russky Reporter” magazine proclaimed Shlykov Russia’s most influential military officer (for further details, see article An Army Professional: Man Who Manages Violence, issue No. 37 (165), Sept. 30, 2010). In December 2008, RIA Novosti spoke to Vitaly Shlykov about the global financial crisis. RIA Novosti: It is possible that the impact on ordinary people of this unforeseen and unexpected crisis is comparable to that of failure for a spy. What are your feelings in response to failure? Vitaly Shlykov: Very different. The first time I was tailed, I had a feeling that it was not real or happening to me: I could see everything, could see the people who were tailing me… I had a feeling it was a game. The second time, when I was actually arrested (it was in Switzerland), it was different. I was shocked at first and realized immediately that it was all very real. Still, as soon as you accept the situation, you immediately start looking for an upside. The first time, I thought: It is good I noticed the tail, that way I will not lead them on to the people I was supposed to meet. In Switzerland, however, I took consolation in the idea that I might have been detained in any other country where it was customary to pull out a suspect’s fingernails, figuratively speaking. You even start rejoicing in the thought that this would never be the case here. This is where emotional recovery starts. The first episode took place under a very tough regime. As soon as I became reconciled with the idea that I would be caught and threatened with death by electric chair, I immediately calmed down: “That’s all”, I thought, “no point in trying anything. Behave with dignity in this situation.” And then calm descended. And once I was calm, I started thinking about whether there was even the smallest chance of escaping. When I saw that there was a chance, I decided to give it a try, though without much hope. But I gave it a try and it turned out right. This is the right mindset to maintain throughout life: in a crisis, think of upsides, it will protect you against panic and the follies and rash actions you might take no matter how hard you try to prepare for such a situation. RIA Novosti: Today, we are flooded by controversial information about the crisis. Sometimes, even heads of different economic offices contradict one another. TV and newspapers are also giving a great deal of advice. Between themselves, people talk about lay-offs, devaluation, troubled banks, etc. And despite all that, you get the impression that no one really understands what is going on. Vitaly Shlykov: To advise studying economics would be a platitude now. I used to have a friend, Yury Yaremenko, whom I consider to be the most outstanding Soviet/Russian economist. He used to say that economics was not even a science, but pure psychology. It is important to understand that crises can be neither foreseen nor prevented. I have a degree in economics and I know that there are 30-40-year economic cycles when even the very economic direction changes. But first, who in Russia, and not only in Russia, has such long-term thinking? Everyone in our country thinks only about the next year or two and even in western countries it is only a little longer. Second, how can one guess which direction the economy will take next? Or how can you explain to a Russian what derivatives – the cause of the ongoing crisis – are? After all, they are an absolutely new phenomenon not even described in classical economics. Even the most outstanding economists were mistaken in their economic development forecasts. RIA Novosti: Under these uncertain conditions, what should a person who has lost his way do? Vitaly Shlykov: Find his way. It is like I said – the most important thing is not to panic and to find positive sides to the situation or even reasons for joy. For instance, the crisis hit western countries much harder than Russia. Or: its impact on the rich was far more disastrous than on the poor or even the middle class. Believe me, tycoons who see their empires fall to pieces (Abramovich, for one, lost $20 billion) suffer much more emotionally than we do. This kind of malicious joy is comforting. Pay no attention to rumors: you cannot build a policy of your own on them. It is also pointless to look for someone to blame. It is equally inadvisable to expect the government to remedy the situation for the average Russian. The best thing to do is to sit down, look within yourself and think what made you lose your way. That is, sort out your own situation first. It is vital that no one should think of himself as just a grain of sand incapable of influencing the situation. It is when a person decides that he is dependent on something or somebody, even his boss, he is doomed; he is lost. “Russky Reporter” magazine spoke with Shlykov in April 2010 on the subject of Russia’s military reforms. Russky Reporter: Do you think that the neoliberal model of reforms gained the upper hand by chance? Vitaly Shlykov: By chance? Hardly. Given time pressure and universal economic ignorance, any remedy that lies on the surface is appealing. Yet I would not lay all the blame on [Yegor] Gaidar, as many tend to do now. After all, he could not be conversant with military economics, since all the materials pertaining to it were top secret in the Soviet Union. My position gave me a chance to gain a good grasp of it, but I could not share the knowledge. You were the first editor of my public materials and you must surely remember our arguments when you wanted to save some of your precious space and tried to cut my long footnotes, but I insisted that each point, no matter how obvious it seemed to you, should refer to open Soviet and foreign sources. Otherwise, I might easily have been accused of divulging state secrets and been silenced for a long time. Even though, in 1990-1991 as deputy minister, I made quite a number of publications declaring that the conditions for the transition were far from ideal in the Soviet Union. 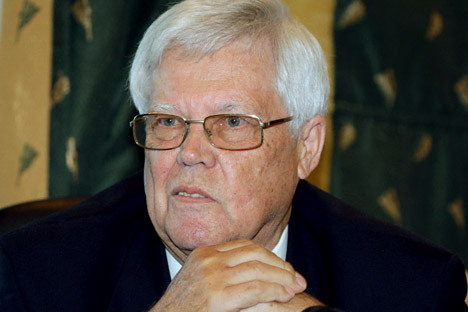 As it happens, however, Yegor Timurovich [Gaidar] was a shrewd and intelligent man and I am positive that, if we had had any chance of discussing things in detail and without haste, as we are now doing, and not just by means of official correspondence, his views on economic reforms would have changed drastically and he might have done a lot of good for the country. Russky Reporter: And finally, let us return to the romantic period in your life – your job as an undercover spy. In past years, you have been fairly willing to share the experience. I remember an article in [Russian daily] “Izvestia,” a TV program Leonid Mlechin made about you, and a story on the Zvezda [television] channel. And last year, you gave an interview to a Swiss newspaper. Are you looking for fame? Vitaly Shlykov: Spies of my level (and hopefully, you do not think of this as immodest) are vain people. But you will not understand the nature of their vanity unless you are one of them. Lawrence of Arabia, whom I see as the greatest spy of the 20th century, was an absolute ascetic. He had one meal a day, never drank alcohol and turned down an order that the king gave him. In the 1920s, already a legend, he joined the air force as a rank-and-file engineer and, later on, moved to a distant military base in British India. I, for one, could never deny myself some little pleasures and Lawrence of Arabia remains the unattainable ideal for me. But, as far as indifference to fame and wealth is concerned, I can compare myself to him. Originally published in the Russian Reporter magazine.